My husband absolutely loves chili. He is known for his famous white chicken chili and has even won a few chili cookoff competitions in the past! I hope to one day to post his recipe if he will ever share his secrets with me! But today our chili isn’t white. We are making some good ol’ warm your soul cilantro lime Instant Pot Chili. I know you are going to love this recipe. It is perfect for all occasions and will feed a large group. We may earn commissions on products purchased though our link. Please read the full disclosure for more info. If you don’t already have an instant pot, I urge you to jump on the bandwagon. I too was skeptical at first because I already had a crockpot. I didn’t think I needed another kitchen appliance but my oh my goodness, instant pot dinners are so yummy! Not to mention you can make a delicious pot of chili from scratch in 30 minutes. 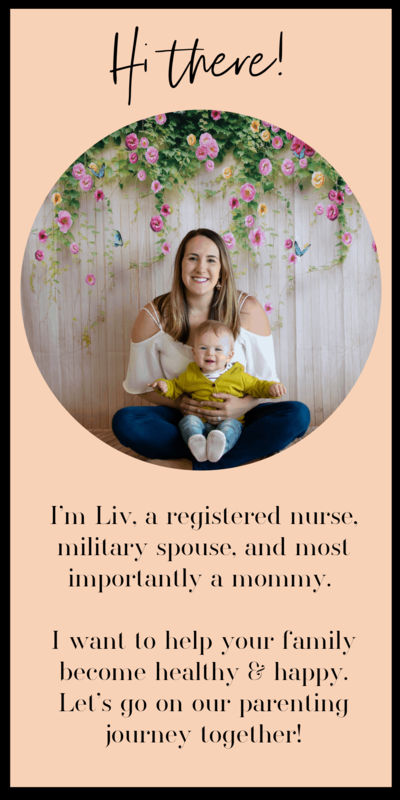 How great is that when you have kids?! 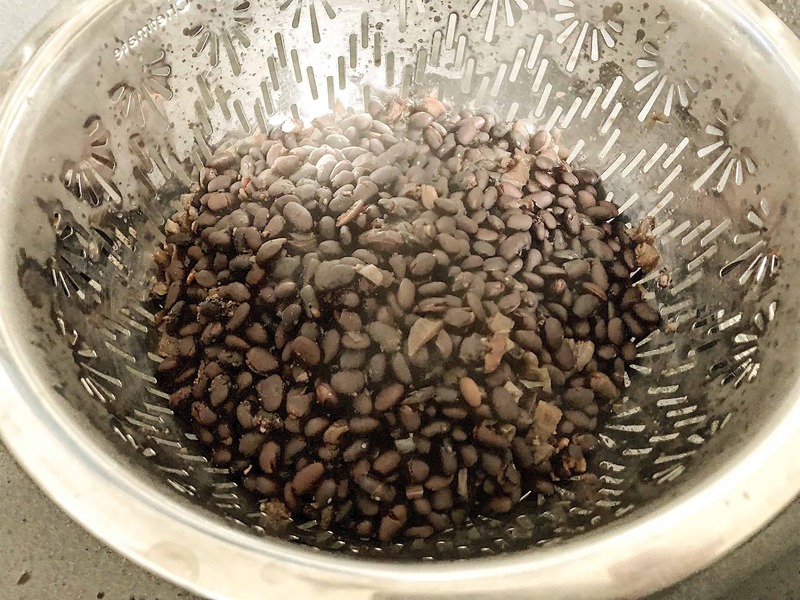 Before I started making my instant pot chili, I actually use the instant pot to cook dried black beans. I try to stay away from canned items as much as possible. Cans are convenient but the lining contains chemicals that leach into our food. It’s best to avoid them when possible! If you have a bit of extra time on your hands, making the beans from scratch is a nice option! 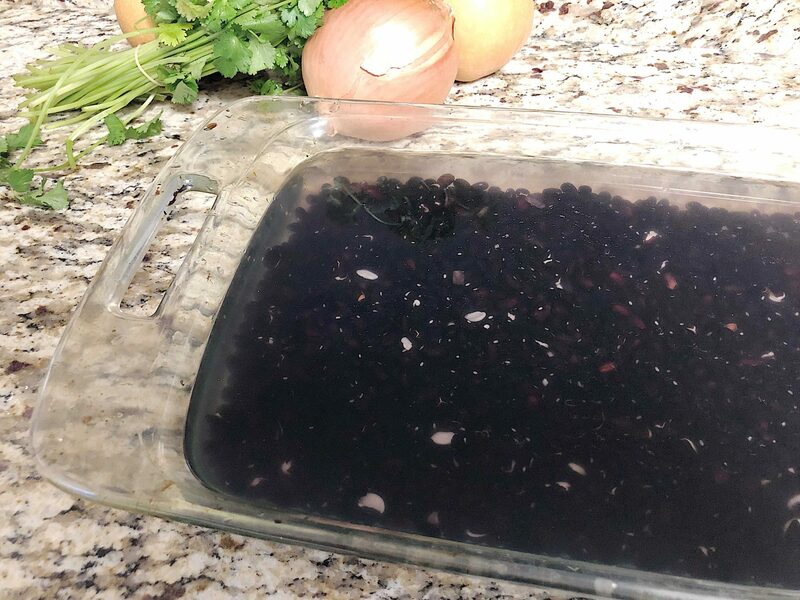 The first thing you will want to do is soak 2 cups of dried black beans for at least 4 hours. It isn’t necessary to soak them for the softening part (the instant pot will cook the beans perfectly without soaking), but your family will be tooting up a storm later if you skip this step! I learned this the hard way the first time I made beans in an instant pot. I made so many that we each took turns eating them each day. You don’t want two people with bad gas in the same bedroom! Never again will I skip the soaking step. After you are done soaking your beans, drain the water and rinse them one more time. 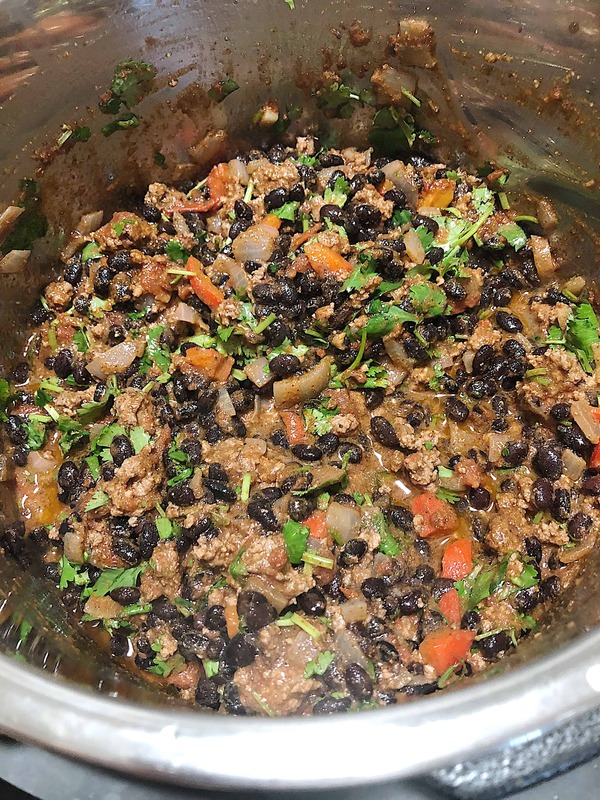 You will place the black beans, 4 cups of water (you can also use chicken broth if you have it on hand), 2 bay leaves, 1 medium onion (chopped), 1 tbsp garlic powder, 1 tbsp of cumin, salt, and pepper in the pot. Close the lid, seal the vent, and press the Bean setting. Once they are done you will vent the instant pot until all the steam is gone, remove the lid, and drain the beans in a colander. 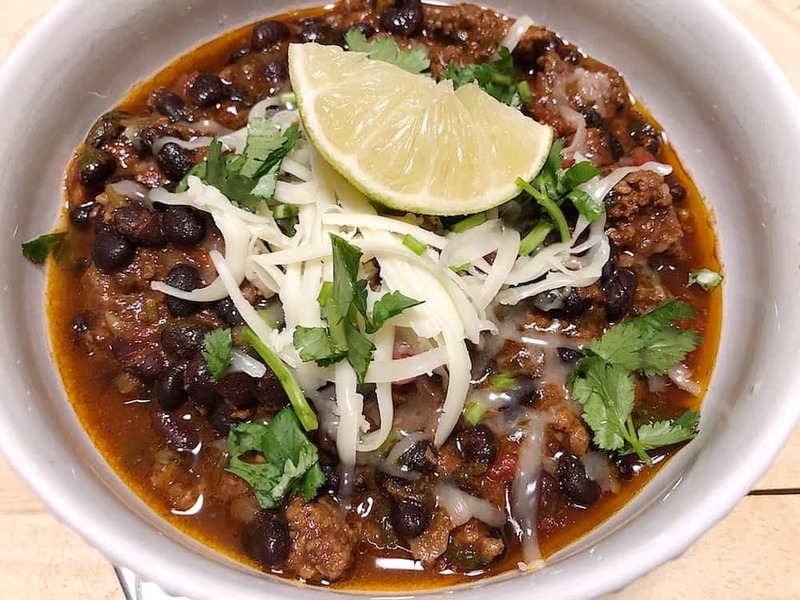 Now you are ready to make instant pot chili! First make sure there aren’t any bean chunks on the bottom of your instant pot. You might want to give it a good rinse before you start. Chop 1 large onion and red bell pepper. With the lid off, push the Sauté setting. Add the onion, bell pepper, and 2 lbs of grass-fed ground beef to the pot. Side note: We love getting sustainably raised grass-fed meat delivered to our door! Check out Butcher Box and save money by buying high quality beef in bulk! Sauté until the beef is browned. There is no need to strain the fat, especially if you use grass-fed beef. Give the contents a quick stir before closing the lid. You want all the ingredients evenly combined. After you close the lid, push the Chili setting, and increase the time to 30 minutes. Don’t forget to seal the vent. It will take a few minutes for the pot to reach cooking pressure, but 30 minutes later you will have a delicious instant pot chili dinner that tastes like you slow cooked it all day. Serve with fresh chopped cilantro, cheddar cheese, and a lime wedge! *Try my 2nd generation homemade salsa recipe as a perfect topper for your chili. Soak the black beans for 4 hours. Then drain the water, rinse them, and drain the water again. Place beans in your instant pot along with the remaining ingredients and stir to combine. Press Bean setting and turn vent to seal. The instant pot will cook the beans on low for 24 minutes. Once they are done cooking, open the vent. After all the steam is released, open the pot and drain the beans into a colindar. 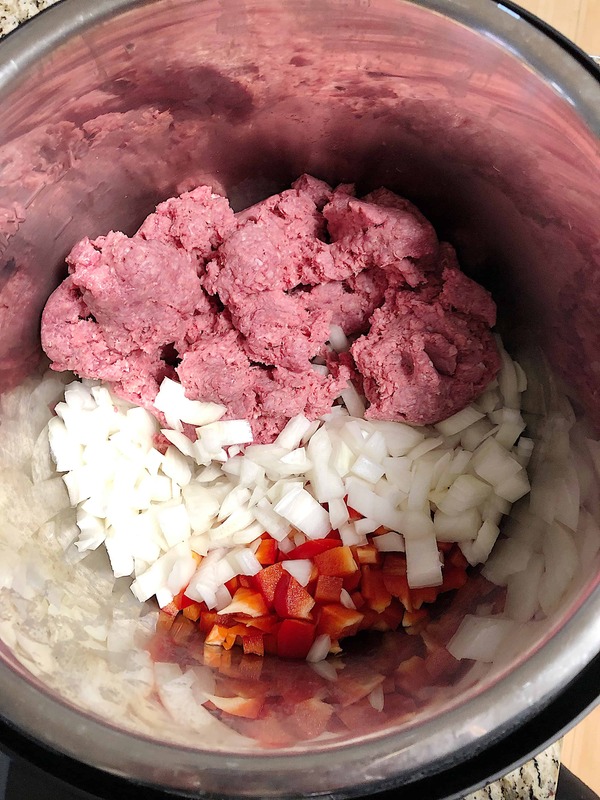 Turn instant pot on sauté setting and add the ground beef, onion, and red bell pepper. Sauté until browned and then press cancel on the instant pot. 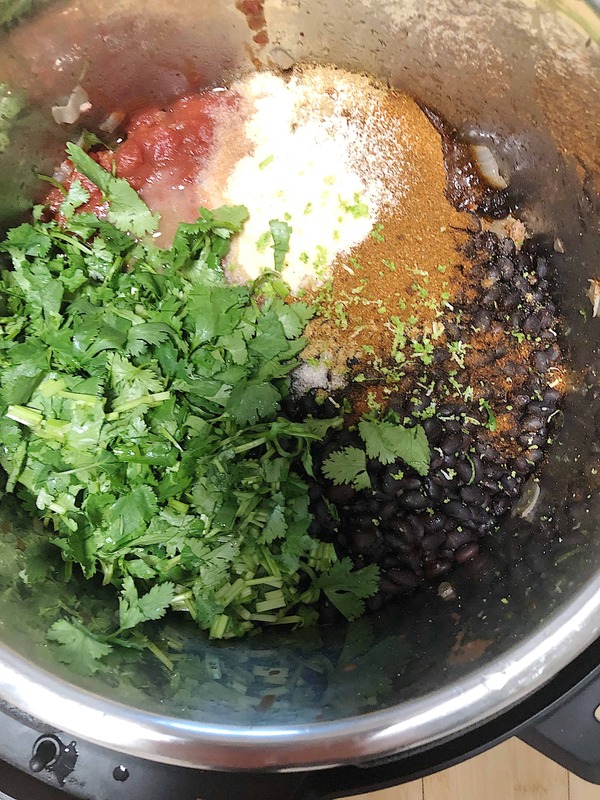 Add the tomatoes, black beans, spices, lime juice, and chopped cilantro to the pot. Using a cheese grader or zester, add the zest of one lime to the pot. Mix ingredients until combined. Close the instant pot lid and seal the vent. Push the Chili setting and increase the time to 30 minutes. After it’s finished cooking, release the vent. 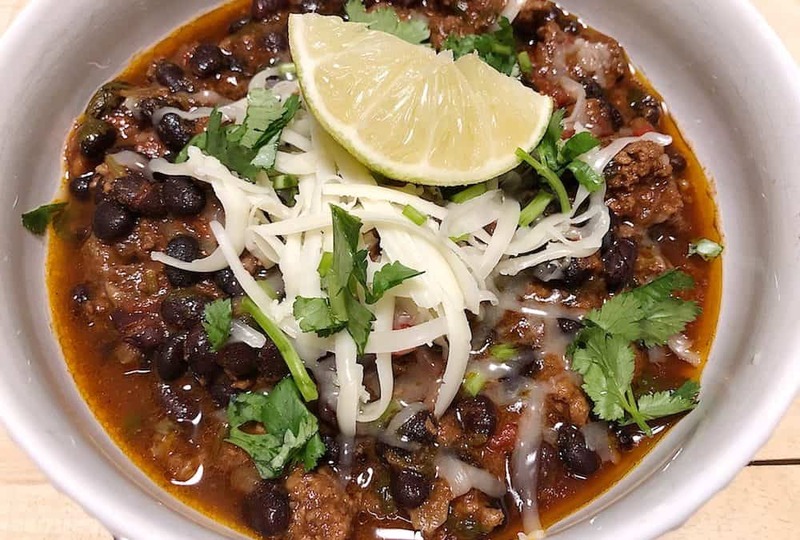 Serve chili with freshly chopped cilantro, graded cheddar cheese, and a fresh lime wedge.